Hi i am facing a problem of minimum connecting time for the below routing.Do the passenger has to done security check-in again. Hi we have a passenger flying SYR/JFK/SLC. Its showing minimum connecting time error. Hi we have one passenger 17th June SYR/JFK/SLC, as per below routing its showing minimum connecting time error. Hi, I'll be coming from Delhi and reaching terminal at 11:40 am on 08th June'12. My connection flight to miami starts from terminal 8 at 13:10 pm . There is 1:30 hrs connection time. Can I go from T4 to T8 by walk after immigration check? Would I be able to make it on time? You should be good to go. You will need to use air train on track 2 from T4 to T8. I arrive from Rio on Tam at Terminal 4. Will I make a flight on Delta to Nice at Terminal 3 in 2hrs 20 mins? Do I need to go through 2 passport controls? I have USA citizenship. Yes you will and you will clear Immigration and Customs. Hi, my girlfriend is arriving in a Delta Flight from Amsterdam on the 31st and she is getting a shuttle with Go Airlink to Manhattan. She is very worried about not finding the counter of that company, so she can be picked up. Since she is not so confident with her english, is there a way to find a map or some instructions on how to get there? Hi, i'm arriving tomorrow at terminal 4 and my parents are arriving half an hour later at terminal 7. 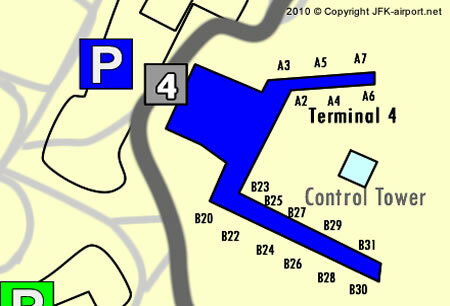 How can i go from terminal 4 to terminal 7 in order to meet them there? thanks! Simple. Air train on track 2 to T7 will do the trick. Is it also possible to go the other way around? Arriving at T7 and taking the train back to T4?